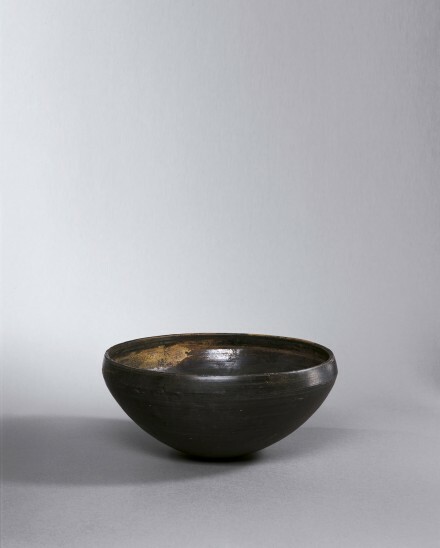 the Buddhist alms bowl with rounded base and flaring sides rising to a wide mouth with upright flattened rim very slightly canted inwards, the fine-textured lightweight dark pottery body with a thin black coating, the smooth burnished surface showing concentric horizontal ‘wheel marks’, with remains of encrusted earth and iron rust from burial. The color and surface of this bowl are probably the result of a reducing atmosphere induced during the firing to darken the clay, followed by the application of a coating of carbon and gypsum which was polished to a high gloss. Compare the black pottery bowl at The Metropolitan Museum of Art, New York, illustrated by An Jiayao in “Tang dai heitao taobo kao” (Study of the Tang Black Pottery Alms Bowls), Han Tang yu bianjiang kaogu yanjiu (Archaeological Study of the Han, Tang and Frontier Cultures), Vol. 1, Science Publishers, Beijing, 1994, p. 259, pl. 2. The black pottery bowls mentioned by the author are described as “mo guang” and “shen tan,” which may be translated as “polished” and “carbonized.” The author also provides several other references to excavations at Tang dynasty Buddhist temple sites published in Kaogu and Kaogu Xuebao where similar black pottery alms bowls have been discovered. Compare also the black pottery bowl of very closely related form, described as having a lacquered surface, which was excavated in 1984 from the tomb of the monk Shenhui, discovered in the base of a Tang dynasty Buddhist pagoda in Longmen, Luoyang, Henan province, illustrated in Luoyang chutu wenwu jicui (Ancient Treasures of Luoyang), Beijing, 1990, no. 95, p. 105. The same bowl is also illustrated in Gudu Luoyang (Luoyang—The Ancient City), Beijing, 1999, p. 169, where the caption indicates that the epitaph on the Eastern wall of the tomb states that monk Shenhui (the fifth Tang Buddhist patriarch) was buried in the first year of Yongtai (A.D. 765).